Levy at the 2017 at the 2017 San Diego Comic-Con. 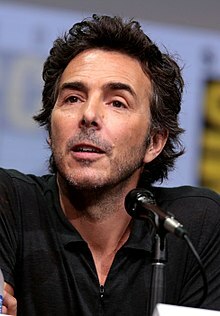 Shawn Adam Levy (born July 23, 1968) is a Canadian director, producer and actor of movies and television. He directed the movies Big Fat Liar (2002), Just Married (2003), Cheaper by the Dozen (2003), The Pink Panther (2006), Night at the Museum (2006), Night at the Museum: Battle of the Smithsonian (2009), Date Night (2010), Real Steel (2011), The Internship (2013), This Is Where I Leave You (2014) and Night at the Museum: Secret of the Tomb (2014). He has also directed episodes of television shows such as The Secret World of Alex Mack, The Famous Jett Jackson and Stranger Things. Levy was born in Montreal, Quebec. He is married to Serena and has four children. He is Jewish. ↑ "Shawn Adam Levy - The Guild / Members". Directors Guild of America. Retrieved November 12, 2017. ↑ Bloom, Nate (February 13, 2017). "The tribe goes to the Oscars". J. The Jewish News of Northern California. Retrieved November 12, 2017. Wikimedia Commons has media related to Shawn Levy. This page was last changed on 12 November 2017, at 04:02.